One of the most common ailments suffered by a large amount of people in today’s fast, hectic and workaholic world is Muscular Pain. It is a very common pain that engages more than one muscle at a single point of time. This pain gets totally unbearable when it is accompanied by the pain in tendons, ligaments and cartilages. Muscular pain, also referred as ‘myalgia’ is a symptom of several disorders and diseases as it brings with it a little amount of fever which works as an alarm for us to know that there is something that needs to be fixed or correctly healed. There can be endless reasons that may result in pain in your muscles but some of the most prominent reasons can be Fatigue, rare activity and activities in long stretch. Muscles are present everywhere in our body hence a person can experience all types of muscular pains, be it in the neck, upper back or lower back. Once the cause is known the pain can be easily eliminated and can be shunned in the near future as well. 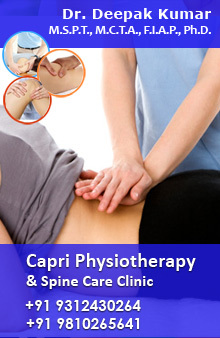 Physiotherapy is the best treatment for all the ones who are the victims of Muscular Pain. Our experts at Delhi Physio after thoroughly understanding your problems devise the various Physiotherapy exercises that work to heal the pain in your muscles, they even conduct the tests to check the causes behind the occurrence of the muscular pain and further come up with assessments that are made on the basis of the results drawn .The experts have rich knowledge about muscular pains and their treatments. The treatment given by us is highly reliable and cost effective, is low on pockets but has a high impact.